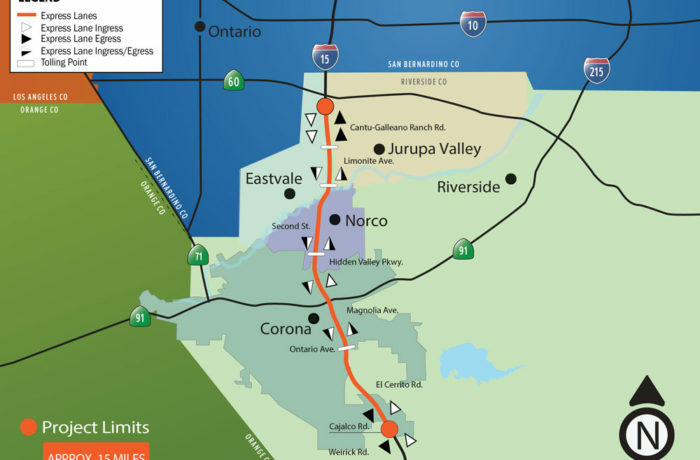 As part of the Riverside County Transportation Commission’s (RCTC) $455 million plan to improve traffic flow and reduce congestion on a portion of the 1-15 between the 1-15/Cajalco Road interchange to the south and the I-15/State Route 60 interchange to the north, a distance of approximately fifteen (15) miles, Owen Group was selected to design and construction management of the Storage and Maintenance Facility Build-outs. Owen Group will provide RCTC with Architectural-Engineering and Construction Management Services for the newly acquired commercial building in Corona, CA which will serve as the Regional Operations Center (ROC) and Storage and Maintenance (SAM). These facilities will be needed to house all of the services required to operate and maintain the toll collection system for the 1-15 Express Lanes. The main purpose of the ROC will be to serve as the centralized facility where all 1-15 Express Lanes operations and maintenance work will take place. These functions include customer service, express lanes monitoring, incident management, equipment maintenance, and other back office activities such as equipment and transponder inventory management, account management and license plate image review. The ROC will include a single walk-in center and a call center where customers can obtain transponders, make payments, resolve violations, and manage their accounts in person or by phone. A Traffic Operations Center will also be located in the ROC where express lane operators can monitor traffic conditions. The purpose of the SAM facility will be to provide storage space for 1-15 Express Lanes operations and maintenance vehicles, equipment and materials. The facility will also house TSP maintenance staff and be used for general equipment maintenance and other miscellaneous maintenance activities. Owen Group a multi-disciplined engineering firm with a long successful history working with RTC, will provide RCTC basic services including initial conceptual design and layout/interior space planning, preparation of final plans and specification and cost estimates, construction bidding and securing all permits as well as construction management services.